Eighty years after the Washington Senators clinched the pennant on the way to their only World Series title comes the announcement that big-league baseball will return to the District of Columbia. The long national nightmare (of no national pastime in the nation's capital) will soon be over. Hopefully, the presidential tradition of throwing out the first ball of the baseball season will again be as perennial a sign of spring in Washington as the cherry blossoms. Somewhere Firpo Marberry is smiling. UPDATE: The Post and AP report on the announcement. A prospective ownership group in Washington is taking requests for season tickets. Old Senators owner Clark Griffith: Seemingly perturbed, with elk * With light bulbs, after night baseball okayed at his park, 1943 * Showing pitchers at spring training in 1953 how he threw the ball in the old days. 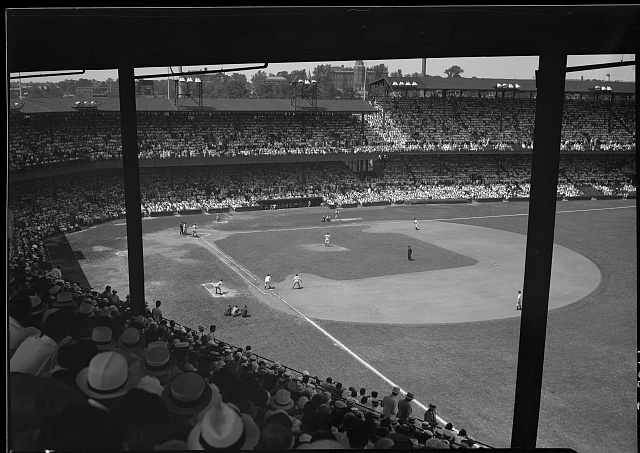 A gallery of old Washington baseball photos includes a nice one of Griffith Stadium, and another of Babe Ruth catching a fly in front of the outfield advertising signs there. 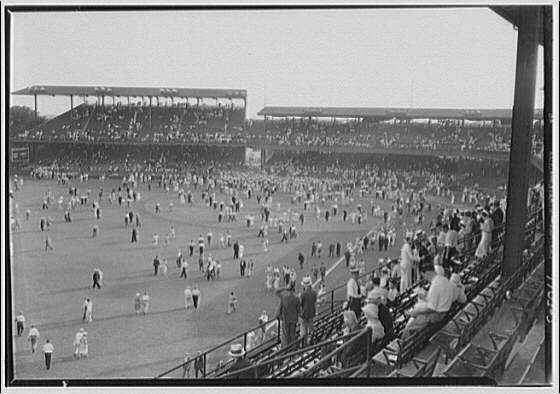 A wonderful picture of fans leaving a game at Griffith Stadium in 1933 is taken from the Washington As it Was collection at American Memory. From the same source, here's another view of the old park. The Teams of Yesteryear forum dedicates a section to discussion of the old Washington Senators. In other sports news in the nation's capital: a poll of American Indians has found an overwhelming majority are not bothered by the Washington Redskins' nickname, supporting what the Wa-hoo-wah lobby at the Dartmouth Review has been saying all along. Meantime, outside the Beltway, the latest Mudville Magazine asks: if rooting for the Cubs and Red Sox is imbued with some sort of cosmic karma, why isn't cheering for the White Sox, who've gone without a championship just as long? Where is the Chisox' Billy Goat, the Pale Hose's Bambino's Curse?